Cummins Inc. executives gathered last month at the company’s technical center, near Columbus, Ind., headquarters, to spotlight a trucking industry future where diesel power will prevail for decades in certain segments, while others evolve around packages coupling internal combustion engines with mild hybrid design, and battery or fuel cells. In the core truck business, they reflected on progress their new on-highway X15 engine has exhibited through eight months of production—42,000 units shipped thus far—and strides the X12 cousin is making in field trials toward a spring 2018 debut. At 600 lbs. lighter than any other 10- to 13-liter class diesel engine for North American on/off-highway vehicles, the X12 is poised for mixer, dump and other weight-sensitive vocational trucks. Upward of 400 artisans, flatwork contractors, ready mixed producers and material dealers or suppliers assembled last month in central Illinois for the Decorative Concrete Fair. Solomon Colors Inc. staged the three-day event near its Springfield headquarters, packing the schedule with demonstrations of namesake and Brickform pigments, stains, stamps and other products involving staff and widely regarded craftsmen; business sessions conducted by industry experts and leading decorative concrete finishing technique trainers; plus, tours of its production and packaging facility. 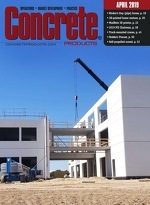 Concrete Products joined the crowd. Clearwater, Fla., water and energy technology specialist Kemco Systems has appointed David Lemen as vice president of Sales and Marketing, where he will lead the team’s water reuse and thermal energy recovery sales force. He has spent the last 11 years in the water and wastewater industry with Evoqua, most recently as business development manager for North American service products.